Desalination and Energy Use…Should We Pass the Salt? Long considered the Holy Grail of water supply, desalination offers the potential of an unlimited source of fresh water purified from the vast oceans of salt water that surround us. Interest in seawater desalination in California is high, with 17 plants proposed along the California coast and two in Mexico. But the rapid expansion of desalination in California – there are currently only a handful of small plants operating along the coast, and most of these are for industrial purposes – raises concerns that must be addressed. 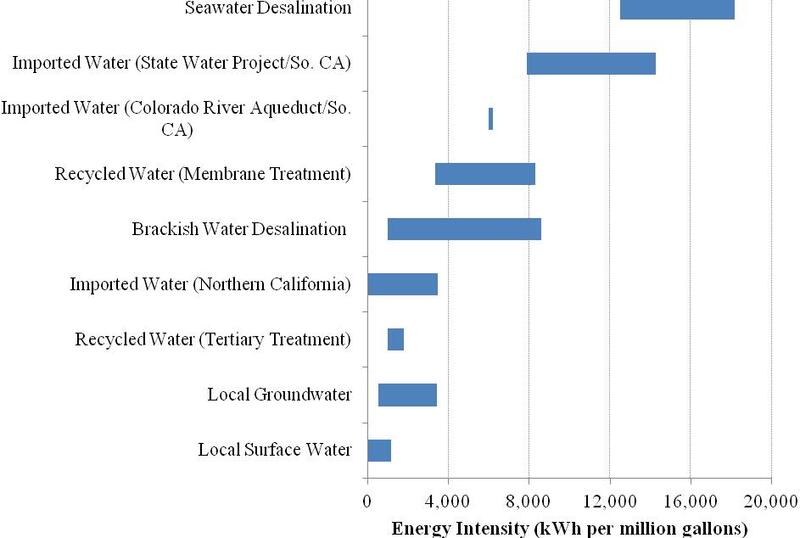 Beginning in 2011, the Pacific Institute initiated a research project on seawater desalination to identify the key outstanding issues for projects in California. As part of that effort, we conducted some 25 one-on-one interviews with industry experts, water agencies, community groups, and regulatory agencies to identify these issues. One-third of those interviewed cited the high energy requirements of desalination plants – and the resulting impact on project cost and greenhouse gas emissions – as a key concern. Indeed, removing the salt from seawater is an energy-intensive process. These energy requirements have declined dramatically over the past 40 years due to a variety of technological advances, and desalination designers and researchers are constantly seeking ways to further reduce energy consumption. Despite these improvements, desalination consumes more energy per gallon than most other water supply and treatment options. Notes: Estimates for local and imported water sources shown here do not include treatment, while those for desalination and recycled water include treatment. Typical treatment requires less than 500 kWh per million gallons. The upper range of imported water for Northern California is based on the energy requirements of the State Water Project along the South Bay Aqueduct. Energy requirements for recycled water refer to the energy required to bring the wastewater that would have been discharged to recycled water standards. Estimates for brackish water desalination are based on a salinity range of 600 – 7,000 mg/l. Figure 1 shows the energy intensity, in kilowatt-hours (kWh) per million gallons, of various water supply options in California. Local sources of groundwater and surface water are among the least energy-intensive options available. Imported water is highly variable, depending on the distance the water is moved and the change in elevation. Some imported water systems use little energy and may even generate it, such as the Los Angeles Aqueduct and San Francisco’s Hetch Hetchy Aqueduct. Most systems that convey water to Southern California, however, use large amounts of energy, although still less than the requirements for seawater desalination, which average about 15,000 kWh per million gallons. But the overall energy implications of a seawater desalination project will depend on whether the water produced replaces an existing source of water or provides a new source of water for growth and development. If water from a desalination plant replaces an existing supply, then the additional energy requirements are simply the difference between the energy use of the seawater desalination plant and those of the existing supply. Producing a new source of water, however, increases the total amount of water that must be delivered, used, and disposed of. Thus, the overall energy implications of the desalination project include the energy requirements for the desalination plant plus the energy required to deliver, use, and dispose of the water that is produced. Conservation and efficiency, by contrast, can help meet the anticipated needs associated with growth by maintaining or even reducing total energy use. Energy is the largest single variable cost for a desalination plant, varying from one-third to more than one-half the cost of produced water. As a result, desalination increases the water supplier’s exposure to energy price variability. In California, and in other regions dependent on hydropower, electricity prices tend to rise during droughts, when runoff, and thus power production, is constrained and electricity demands are high. Additionally, electricity prices in California are projected to rise by nearly one-third between 2008 and 2020 (in inflation-adjusted dollars) to maintain and replace aging infrastructure, meet new demand growth, and increase renewable energy production, among other things. Rising energy prices will affect the price of all water sources but will have the greatest impact on those that are the most energy intensive. The high energy requirements of seawater desalination also raise concerns about greenhouse gas emissions. In 2006, California lawmakers passed the Global Warming Solutions Act, also known as Assembly Bill 32 (AB 32), which requires the state to reduce greenhouse gas emissions to 1990 levels by 2020. AB32 has put the state on a carbon diet, which includes cutting current emissions and preventing future emissions associated with growth. Desalination ¬¬– through increased energy use – can increase greenhouse gas emissions, further contributing to the root cause of climate change and running counter to the state’s greenhouse gas reduction goals. We can mitigate the greenhouse gas emissions of desalination plants by powering them with renewables. But is renewable desalination the answer? Certainly, renewables can reduce and/or eliminate the greenhouse gas emissions associated with a particular project. This may assuage some concerns about the massive energy requirements of these systems and may help to gain local, and even regulatory, support. But it is important to look at the larger context. Even renewables have a social, economic, and environmental cost, albeit less than conventional fossil fuels. Furthermore, these renewables could be used to reduce existing emissions, rather than offset new emissions and maintain current greenhouse gas levels. Communities should consider whether there are less energy-intensive options available to meet water demand, such as through conservation and efficiency, water reuse, brackish water desalination, stormwater capture, and rainwater harvesting. Certainly energy use is not the only factor that should be used to guide decision making. However, given the increased understanding of the risks of climate change for our water resources, the importance of evaluating and mitigating energy use and greenhouse gas emissions is likely to grow. Thanks for sharing this post, Maven.